For the latest update on the EpiPen shortage in Canada, see Allergic Living’s article here. Canada’s health regulator has expanded its warning about a supply shortage of EpiPen auto-injectors in Canada to include the junior version of the device. In January, Health Canada announced a shortage of 0.3 mg auto-injectors for older children and adults. Now, it is advising of a supply shortage of EpiPen Jr., too. A supply shortage of EpiPen 0.3 mg was also announced in April in the U.K. The EpiPen Jr. has not been affected in that market. So far the U.S. supply has not been affected. Allergic Living asked Pfizer Inc., which manufactures the EpiPen from a Missouri facility, to get clarification on the reasons for the Canadian and U.K. shortages, when they’re anticipated to resolve, and whether the U.S. market might also face shortages in future. Pfizer spokesperson Kim Bencker did not reply to those specifics, but commented: “We understand how important this potentially life-saving product is to patients, and are working tirelessly to increase production and expedite shipments as rapidly as possible.” Meantime, her Pfizer colleague Steve Danehy told Reuters: “We are shipping product. 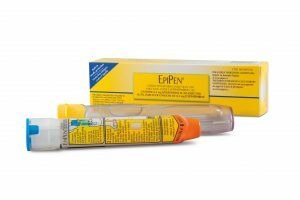 Currently there is no shortage in the U.S.” Pfizer is the distributor in Canada, while Mylan NV manages distribution in the U.S. and the U.K.
A shortage in Canada is problematic since, unlike the U.S. and the U.K., there is no other epinephrine auto-injector currently available for patients with food or sting allergies. During the shortage, Health Canada recommends in an anaphylactic emergency that Canadians use an expired auto-injector, if that’s all that is available. The agency reminds of the protocol to use it and then contact 911 immediately. Canadians can stay up-to-date about the shortage and estimated re-supply dates by visiting Drug Shortages Canada.